We come to you with gratitude for the knowledge and teachings that you have left for the people. The vision you had for Holy Hill is being continued and emerging now as Aahnii Grandmother Kee. Your work and dreams of sharing and connecting with others is manifesting. AHO! Connecting Cultures, Communities and the Environment in the Web of Life, for the Good of All. 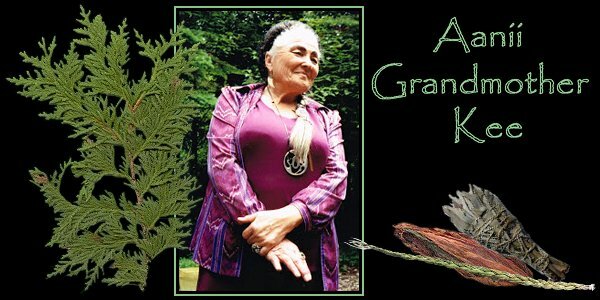 The Holy Hill Center (Now known as Aanii Grandmother Kee) was founded in 1995 by Keewaydinoquay for the purposes of sharing the history, traditions and teachings of all Native Peoples, especially those of the Great Lakes Region. The Vision of the the Center is to serve as a catalyst to awaken, educate and inspire all people to an awareness of the Interconnectedness of All Life. We are all related. All Life is connected. What is done to one is done to all and connects to the sustainable web of the mineral world, plants, animals and humankind. Respect the Gone-Befores, and the Elders and the Children. Care for Mother Earth. Stand together in the Circle and live life to the fullest, making responsible choices. Everyone is needed. Everyone has a part. Aanii Grandmother Kee serves as a repository of information regarding indigenous societies. We provide publications, lectures, classes, workshops and exhibits. Subjects include: Traditional Uses of Herbs, Philosophy, Native Prayer, Spirituality, Arts and Crafts of Woodland Peoples, Survival Skills, Outdoor Education, and Integration of Traditional Values into Modern Life for People of All Ages. "To preserve the knowledge of the Elders In order that Wisdom gained by Past Generations Is made available to This Generation, To ensure the survival and prospering Of the Seventh Generation." 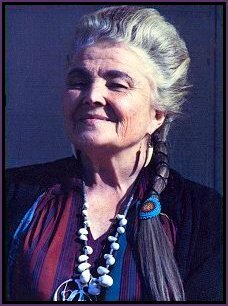 KEEWAYDINOQUAY Woman of the Northwest Wind A native of Michigan raised in both Native American and European traditions, Kee is the only person of her era known to study both traditional Ojibwa and Western uses of plants for medicines. As a young girl she studied with native herbalists. As an adult she was a Ph.D. candidate at the University of Michigan in Ann Arbor and taught Ethnobotany at the University of Wisconsin in Milwaukee. Click on KEEWAYDINOQUAY's underlined name above to learn more about her. WALK IN THE WOODS For Children & their Adults! Story by the creek.... Snacks.... Walk in the woods.... We will be learning about some of the many plants CREATOR has given us. We will talk about which ones can be used for food, which ones can be used as medicine and which ones we should NEVER put in our mouths! This event can of course also be attended by adults without the accompaniment of children.... Anyone who loves plants and the outdoors is welcome! This activity will start again in the spring and will be held often, so watch for dates and times! Click here to visit our and to see their special offers. Dear Supporter: As a non-profit organization, we are always looking for ways to help fund our operations without putting a large burden on the people we serve and without increasing our administrative costs. Recently, we took advantage of an opportunity to participate in a program offered by Meijer. We are now enrolled in Meijer Community RewardsSM. FOR MORE INFO visit the supporters link. OUR ORGANIZATION We are a Non-profit organization under the laws of the State of Michigan and Section 501 (c)(3) of the Internal Revenue Service. Donations Welcome! As a non-profit, we appreciate any and all donations! Donations are tax-deductible on both Michigan and Federal taxes. Your support keeps us running! If you would like to contribute to our teaching center, please leave a message in our email and we will contact you! Thank you very much! Migwetch!